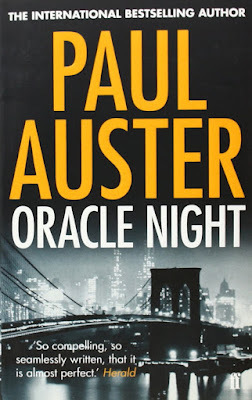 Hmm, they say that you either love or hate Paul Auster's works. I must say I belong to the latter category. See, while I was in Paris earlier this year, I was in a bookstore at Paris Montparnasse Station, waiting for a train. Paul Auster's novel 4 3 2 1 caught my eye. I didn't buy it that time, since it was a fairly thick book and I didn't want to lug it all day long while exploring Chartres. In any case, I forgot about it until I was back in Berlin, in the house of a friend, when I saw his bookshelf, loaded with several of Paul Auster's novels, including 4 3 2 1. I asked him for his opinion about that novel, and he said that if I hadn't read any of Paul Auster's work, then he doesn't suggest I begin with that. He lent me Oracle Night instead. And boy I must say I am glad I have read this thin book instead, since I seem to hate the style. See, this book uses the frame narrative, which is a literary device that I actually enjoy. However, the characters are all entities that I find hard to relate, let alone sympathise. It felt like reading Salman Rushdie with ordinary people. No, I take that back. It felt like reading Salman Rushdie with annoying and irritating people. So why are they irritating? The thing is, these people (whether it's the narrator Sidney Orr, or the protagonist in the novel Sidney is writing, or the various other people that come and go) are irrational, and they throw reason out the window the moment some coincidence appears. One guy almost got killed by a falling concrete gargoyle, and because of that decides to drop everything and fly out to Kansas City and change careers. He ends up being a handyman cataloguing tomes and tomes of phonebooks from all over the world, which are all stored in an underground bunker library where he accidentally traps himself. Absurd, bizarre, and outright unbelievable. I mean, I know that life is full of coincidences. But just because there are coincidental and random things one encounters on a daily basis, doesn't mean that reason is futile. This book reminds me of a book I once read ten years ago, The Search for the Dice Man by Luke Rhinehart. I wish I didn't pick up that book in a bookstore in Copenhagen. I ended up being irritated by it. And I remember my irritation as exactly the same feeling I had when I was reading this book. I must say, the ending was quite interesting. The author successfully wrapped up things and tied everything together, providing a plausible ending. There were some stories that didn't have an ending: Auster simply employed deus ex machina and ended these stories by having the narrator rip apart the pages and throw them away. But at least the main story had a plausible wrap-up. Oh, I also didn't understand why the author was playing quite a few racist stereotypes. There were three characters that were not white. There's Chang, a Chinese immigrant who has a small stationary store but later violently attacks the main character. There's Martine, a prostitute from Haiti. And there's Regine, a housekeeper from Martinique. So why are all the non-white characters given these roles of second-class citizens? Given that this novel was published in 2003, I find it ludicrous. Overall, I didn't enjoy this novel. And I don't think I am going to try any other of Paul Auster's novels any time soon. I suppose I won't put 4 3 2 1 on my reading list. I give this 2 out of 5 stars. Not for me.